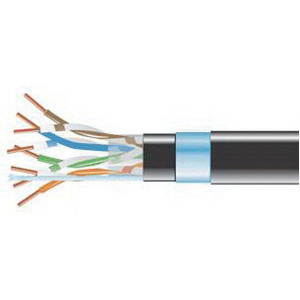 Omni Cable 24/25P Cat 3 UTP Plenum-rated data/voice cable has gray PVC jacket to withstand harsh environmental conditions. The PVC insulation resists electrical leakage and offers protection against environmental threats. This cable has outside diameter of 0.39-Inch. This bare copper cable is suitable for 4 Mbps Token Ring and 10 Mbps 10 Base-T Ethernet applications. Cable meets ANSI/ICEA S-90-661-1994, ANSI/TIA/EIA 568-A, FCC Part 68 standards.